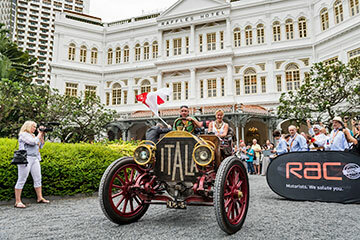 The flag fell at 9:01 outside Raffles Hotel and the cars inched past the crowds on the pavement for the short drive to the Singapore / Malaysia frontier. Today's route consisted of a long sweep from one side of the country to the other, finishing at the beach resort of Desaru on the eastern seaboard. While the competitors dined to the sound of traditional Malaysian music with brightly coloured folk dancers on the stage, the Results Team were crunching the numbers from today's sporting activities. 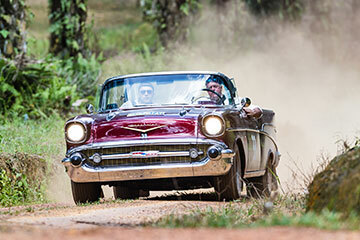 With the help of the local authorities, a 12 kilometre closed-road timed test section was staged during the afternoon with crews negotiating a twisty and demanding gravel track that carved its way through a dense palm tree plantation. Who set the best time then? Gerry Crown threaded his big Leyland P76 with its growling V8 engine through the trees to knock off the first test in one second over seven minutes, with navigator Matt Bryson looking delighted as the car slid across the finish line. A determined drive from Grant Tromans in his ex-London to Capetown Datsun 240Z was just four seconds slower, and matching the Datsun’s pace was Peter Lovett's Porsche 911 two-litre. Garrick Staples in the nimble VW Beetle was just two seconds down on the Datsun and Porsche, with Paul Merryweather's Mercedes 300SE cabrio matching the Beetles time. David and Hilary Tomlin with their Ford V8 Coupe were just four seconds slower than the Vintageant pacesetter, Bill Shields in his Chevy Coupe who set best pre-war time of 8:01. Phil Garrett and Kieron Brown in the red Chevrolet Fangio Coupe that has twice won the Peking to Paris – surely the only car to win outright two long-distance marathon-rallies – were third best Vintageant on 8:16. If there had been a hero of the day award it would surely have gone to John Rich, who hurled one of the biggest - and more unlikely - rallycars through the trees, sliding the enormous Chevrolet Bel Air through the twists and turns to post a time of 8:25, the V8 three-ton open-topped monster with its mouth-organ grille seemingly grinning wider as the dust clouds bigger and bigger. The car runs standard street tyres without the benefit of a chunky tread pattern of most other cars yet the cigar-chomping John Rich scored a top ten result. To celebrate the achievement, he promptly put a cigar in his mouth at the finish and then asked the marshals, Chris Elkins and Ed Rutherford, if they had a light. Surrounded by highly inflammable oil palm trees, John Rich clearly enjoys days like these, packed with gung-ho derring-do. As for Chris and Ed, they were rather hoping to be offered a beer from the car's fridge, having spent nearly three hours toiling in the sun with reels of barrier-tape that block wrong junctions, all part of the work that goes into a slickly-run Timed Section. Joerg and Louis Lemberg posted the best Bentley effort, on 8:33, with the Rolner’s Bentley on 9:02, in between these two cars are Rudi Friedrichs in his well travelled pre-war Alvis, and the Datsun 240Z of the Saxenas. Also going well today was the Volvo of Nicholas Pryor and Lesley Stockwell, who passed several cars in the dusty forest test, and Patrick and Christine Sommer in a VW Karman Ghia. Trouble struck the big Mercedes 300SE of Natalie and Nicola Pohl, suffering problems with the rear air suspension, and the silver Datsun 240Z of Roy Stephenson and Peter Robinson stopped half way through the Test when the differential carrier came loose, but the crew were optimistic the sweep-team of roving mechanics could fix this tonight. So, the rally leader is Gerry Crown - at 82 the oldest driver here. It's been a long and demanding day. With the big glass bedroom windows thrown open a fresh breeze from the beach below rattles the bedroom curtains. It's a warm balmy evening as we turn in for bed to the rhythmic sound from the pounding waves of the China Sea.